The writer finds that when it comes to marathoning "Star Trek," resistance is futile. Back in 2012, after a difficult year at an unsatisfying job that ended with a disagreeable departure, my life was in rough shape. Freelancing was barely making ends meet. Sending out hundreds of applications was wearing me down. To add insult to injury, most nights, I simply couldn't sleep. Something about the show's optimistic message stuck with me. Technology can improve our lives. We can conquer our deeply held prejudices. There is other life out there, and it is willing to cooperate with us. And, importantly, no matter how far we come as a society, there will always be room for adventurers. There's something uplifting about "Star Trek," even when you're at your lowest, so I turned it on and figured I would watch until I could fall asleep. The next night, I watched another episode, and sleep came a little easier. And so on and so forth, until I had completed "Enterprise," nd procured a new job. But why stop there, I thought? I was onto something, and something good. What if I kept going and watched every single episode and movie of "Star Trek" ever made? I turned on the original series, and the rest is history. Three and a half years after I started the process, I finished it. Though I can't recommend it for everyone, people who have watched some "Star Trek" and enjoyed it should at least sit down and watch one of the five series start to finish. What's the best thing about "Star Trek"? While the answer to this question varies from person to person, to me, "Star Trek" succeeds because it combines everything that's entertaining into a single franchise. There are gunfights, fistfights and ship-to-ship combat for action aficionados. Most episodes feature allegorical stories that pose difficult questions about our everyday society, addressing issues such as racism, homophobia, civil liberties, religion, personhood and the rules of war. Each series features an appealing mix of characters who play off of the others' foibles, like Mr. Spock's logic confounding Dr. McCoy's sense of wonder, or Constable Odo's hard-nosed investigations foiling Quark's get-rich-quick schemes. Best Movies? "The Wrath of Khan," "The Undiscovered Country", and "First Contact"
What's the worst thing about Star Trek? Simply put, considering the franchise comprises 726 episodes across 30 seasons of TV and 12 movies released between 1979 and 2013, it's not all going to be good. The show's worst sin, in my opinion, is that it's occasionally just boring. Not every TV show is going to be guns-blazing action all the time. But when "Star Trek" gets the pacing wrong, it's spectacularly wrong. Some episodes, particularly of "The Next Generation" and "Enterprise," are about the most minor diplomatic infractions imaginable, with forced banter between underdeveloped characters to populate the almost invariably inconsequential B-story. The first "Star Trek" movie can be almost unbearable to watch. Prepare for two and a half hours of absolutely nothing happening until the almost-brilliant-enough-to-justify-the-rest last five minutes. There's a reason they call it "The Motionless Picture." Worst Movies? "The Final Frontier," "Insurrection," and "Into Darkness." Archer. Yeah. I said it. Come at me, space bros.
Star Trek is an optimistic vision of our future, but it's also a cheesy space opera. It's a font of realistic, believable technology, but it's also a sci-fi series that leans heavily on fantastical elements. It's brilliant, overwrought, heartfelt, campy, profound and silly. Across so many episodes and films, it has time to be all of those contradictory things, and more. That's the big secret of "Star Trek." It doesn't really have any alien races; it has metaphors. Vulcans represent our logic, Klingons our pugnacity, Romulans our secrecy, Ferengi our greed, Bajorans our spirituality, Betazoids our empathy and Borg our overreliance on technology. In each race, there is something admirable and something twisted, and humanity can embody both sides of the gold-pressed latinum coin. 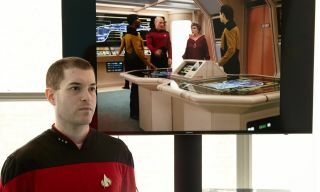 While it's not a novel observation, the reason "Star Trek" feels unique, even in a world of more ambitious sci-fi properties like "Battlestar Galactica" and "Black Mirror," is because it alone asserts that technology will make our lives better, not worse. Space travel will bring about untold prosperity and limitless adventures, not the agonizing downfall of humanity. There will be challenges to face and enemies to fight, of course, but "Star Trek" has always been more about conflict resolution than the conflict itself. This is why it's such a valuable property; this is why it had the power to bring me out of the blackest period of my life. If you choose to boldly go on your own "Star Trek" streaming adventure, get ready for some good times, some bad times and a lot of unforgettable sci-fi moments. Engage.